This Act shall be called the Indian Penal Code, and shall extend to the whole of India [except the State of Jammu and Kashmir]. Every person shall be liable to punishment under this Code and not otherwise for every act or omission contrary to the provisions thereof, of which he shall be guilty within [India]. 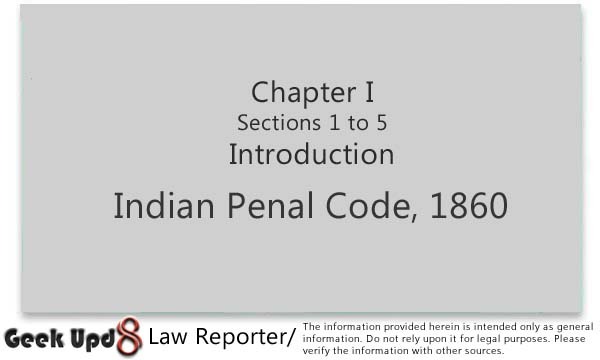 Any person liable, by any [Indian law], to be tried for an offence committed beyond [India] shall be dealt with according to the provisions of this Code for any act committed beyond [India] in the same manner as if such act had been committed within [India]. (3) Any person in any palce without and beyond India committing offence targeting a computer resource located in India. (b) the expression "computer resource" shall have the meaning assigned to it in clause (k) of sub-section (1) of Section 2 of the Information Technology Act, 2000(21 of 2000). Explanation. - In this section the word "offence" includes every act committed outside India which, if committed in India, would be punishable under this Code. [Illustration] : A, who is [a citizen of India], commits a murder in Uganda. He can be tried and convicted of murder in any place in [India] in which he may be found. Nothing in this Act shall affect the provisions of any Act for punishing mutiny and desertion of officers, soldiers, sailors or airmen in the service of the Government of India or the provisions of any special or local law.